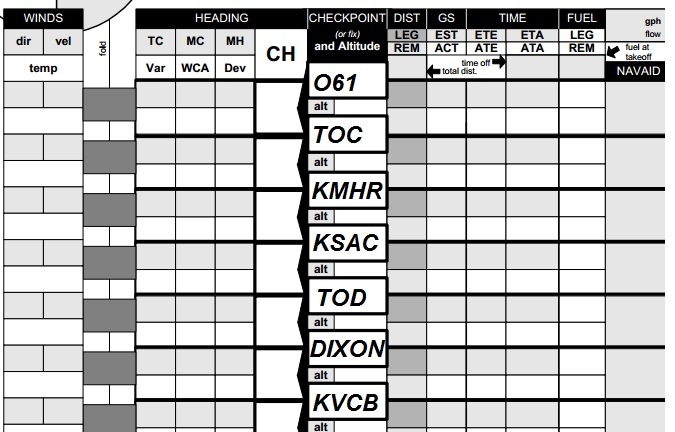 A navigation log is a tool that you use to guide your preflight planning, and a plan that you execute in flight. The value you obtain from the navigation log is the centralization of all of the information you need in an easy to read, single location. There are many different versions of navigation logs. Many aviation publishers sell printed copies, there are electronic versions available on the internet, and online and tablet-based flight planners can automatically generate navigation logs. Many pilots create their own version in spreadsheet software to have control over how the information is organized, tailoring the format to their own specific needs. You will learn how to complete a navigation log using an example flight. After you have flown this flight, think about how the experience of preparing the navigation log aided situational awareness in flight. Also, you may want to make changes to what information you include in the navigation log, or use a different navigation log format. Before starting to complete the navigation log, a review of terms and abbreviations is important. TC True Course The angle between your course and true north. MC Magnetic Course The angle between your course and magnetic north. Var Magnetic Variation The number of degrees left or right used to correct a true course to a magnetic course. WCA Wind Correction Angle The correction applied to a course to correct for wind drift. See Using the E6-B Flight Computer to calculate. Dev Magnetic Deviation Each magnetic compass has built-in errors due to magnetic fields in the airplane affecting the compass’s accuracy. The compass deviation correction card, which is calculated for each compass installation, provides corrections in 30° increments. CH Compass Heading This is the compass heading you will fly for a specific leg of your flight in your specific airplane. ETE Estimated Time Enroute You will calculate the amount of time you expect to fly each leg using deduced reckoning. ATE Actual Time Enroute You will record the actual amount of time each leg took to fly. You’ll use a timer in the airplane to measure this. 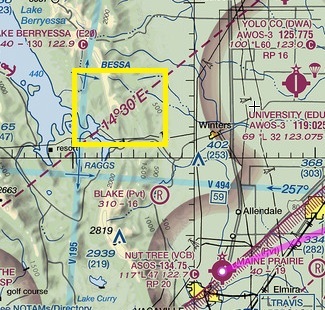 This tutorial uses Dauntless Software’s VFR Cross Country Flight Planner – Version B. Print a copy of this planner out now and follow along using the tutorial. You can check out the other versions of this planner, as well as pilot submitted versions here. Use a pencil when filling out the navigation log; you’ll inevitably need to make corrections. Plot your course Using your plotter, draw a course line on your sectional chart. Use a pencil or better yet, an erasable highlighter so that its easier to view your course line. Note that you don’t always go directly from your departure to your destination airport. You may need to fly around terrain or airspace, navigate using radio navigation radials, or choose a route that is over airports. After drawing your course, examine the terrain and airspace along your route. You may find that you need to alter the course. Also, this examination is the first step in developing situational awareness about your flight. Are there airports along your route of flight that are suitable for diversion? Are there any types of special use airspace, MTRs, parachute operations, wilderness areas, obstructions, or other unique features? In this example, I’ve plotted a course between Cameron Airpark (O61) and Nutree Airport (KVCB). You’ll see that I’m going to change this plot in the next step in order for the course to fly over easier to recognize checkpoints. Checkpoints should be clearly identifiable landmarks along your route of flight, spaced every 10-20 miles. Try to pick checkpoints that you’ll be able to see from your previous checkpoint, as this will give you an object to point the airplane towards in-flight. Airports can also make great checkpoints because they’ll help you learn how to spot airports in flight, and they help you maintain situational awareness of your closest alternate airport. As you approach your destination airport, you should identify a 10 NM and 5 NM checkpoint to aid you in identifying the airport. They will also serve as triggers for making radio announcements at a uncontrolled field, or establishing contact with the tower at a tower controlled field. You can see below that I’ve replotted my course using identifiable checkpoints. I’ve chosen over Mather Airport, over Sacramento Airport, and over the town of Dixon as my checkpoints which each have a large X over them. I’ve started to fill out the navigation log, listing the departure airport first, then a checkpoint named ‘TOC’ which is not a true checkpoint, but a reminder to calculate the airplane’s performance to ‘Top of Climb’. I’ve then entered my selected checkpoints, and one additional checkpoint just prior to my destination, ‘TOD’, which stands for ‘Top of Descent’ and is a reminder to initiate my descent from cruise altitude. We’ll calculate TOD in a subsequent step. I’m predicting that I’ll need to start my TOD prior to reaching the Dixon checkpoint, but this may not be correct, and I may need to swap the order of the TOD and Dixon checkpoints. Measure Distances and True Course Using your navigation plotter, determine the true course along your course line, and measure the distances between checkpoints. Enter these values in the navigation log, and total the distances. I’ve determined the true course and distances between each checkpoint. Note that I’ve skipped lines around the TOC and TOD checkpoints as we do not need to change course at these points, and we don’t yet know the distance to these points. Obtain winds aloft You can obtain a weather briefing from LMFS/DUAT/DUATS or look up just the Winds & Temps Aloft for the Pacific Coast. Find the reporting stations along your route of flight. If you unfamiliar with the station identifiers, searching for the identifer using flight planning website such as AirNav. For this example, we’ll use the SAC winds and temps aloft as the SAC reporting point is the closest reporting station along our route of flight. 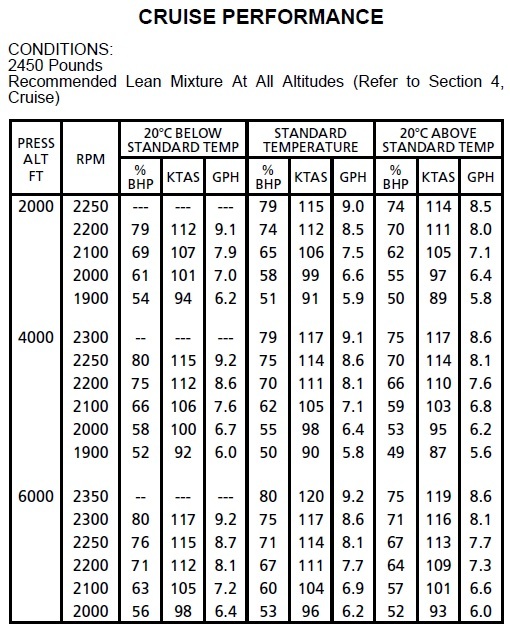 The optimum cruise altitude for any flight depends on a number of factors. Obstacle Clearance – Compare the field elevation of your departure airport, destination airport and all terrain and obstructions 10 miles each side of your planned course to determine the height of the tallest obstruction. Add 2000 ft to this altitude. This is your minimum safe altitude that will ensure obstacle clearance, give you a few miles of glide range if the airplane experience engine failure, and will help you see checkpoints and your destination airport. This is a minimum altitude, not the optimum altitude. Winds Aloft – Compare the true course for your flight with the winds aloft. Recall that the winds aloft are aligned with true north. Determine if specific altitudes have a favorable headwind or unfavorable tailwind. Generally, winds will increase as you climb. If flying against a headwind, stay low; if flying with a tailwind, climb and take advantage of the ‘free’ groundspeed. Fuel Burn vs TAS – Using the Cruise Performance table or chart in Chapter 5 of your airplane’s flight manual, determine the optimum altitude by comparing fuel burn to TAS. Generally, cruise power settings are between 65-75% BHP (brake horsepower), TAS increases as altitude increases due to the reduction in drag due to decreasing air density, and normally aspirated airplane engines cannot develop 75% BHP above 8500 ft due to the reduction in air density (and thus oxygen) at altitude. Generally, 8500 is going to be the most efficient altitude for a normally aspirated engine, balancing the highest TAS with least amount of fuel burned per knot of TAS. VFR cruising altitude – 14 CFR 91.159 requires use of a VFR cruising altitude when 3000 AGL or higher and in cruise flight. Select an even altitude + 500 ft for a magnetic course between 180-359°, and an odd altitude + 500 ft for a magnetic course between 350 and 179°. Obstacle Clearance – In this example, we are departing from O61 (field elevation 1287) and landing at Nutree (field elevation 117). There is no terrain or obstacles along the route of flight. However, there is Mather and Sacramento’s Class D airspace that we can either fly through with ATC approval, but experience has shown that ATC will typically require us to maintain at or above 3000 MSL when overflying Mather’s Class D. This results in a good minimum altitude for this flight of 3000 ft MSL. Winds Aloft – Recalling that our average true course is 240°, let’s determine which altitudes are most favorable. You can use your Crosswind Component chart or the 579 rule of thumb. Staying down low will results in the least amount of headwind. Performance – Analyzing the Cruise Performance table for the CE-172-R shows us that flying at 8000 ft gives us the maximum TAS and an efficient fuel burn. VFR Cruising Altitude – A true course of 240° converts to a magnetic course of about 225° with 15° E variation in the Sacramento area. This is a westerly course, requiring an even altitude plus 500 ft. We could choose 4500, 6500, 8500, etc. This sets us up to use 4500 ft as our cruise altitude. For the WCA and GS calculations, we’ll need to use the interpolation of the 3000 and 6000 ft winds. As the 3000 ft winds are light and variable and the 6000 ft winds are 200 @ 9, interpolation is difficult. You can either choose the light and variable, or keep the 200° and halve the velocity, which I’ll round up to 5 knots, giving us a forecast winds aloft at 4500 ft of 200 @ 5 knots, and a temperature of 9° C (I used the standard temperature lapse rate, adding 3° C for the 1500 ft difference between 6000 ft and 4500 ft). We can also determine our TAS and fuel burn rate. 9° C at 4500 ft is 3° above standard temperature (recall that 15° C is standard temperature at sea level and the lapse rate is 2° C per 1000 ft of altitude which would result in a standard temperature of 6° C at 4500 ft.). This means we should use the Standard Temperature column in the cruise performance chart. Next, interpolate the 4000 ft and 6000 ft for 2250 RPM, which is 75% BHP at 4000 ft. TAS is 114 knots for both 4000 and 6000 ft, so no interpolation is required. Fuel burn rate is 8.6 GPH at 4000 ft, and 8.1 GPH at 6000 ft, resulting in a burn rate of 8.475 at 4500 ft. Round this up to 8.5 GPH. We’ll update our navigation log with winds aloft and temperature, cruise altitudes, burn rate and we’ll write in the notes section ‘TAS 114 knots at 2250 RPM’. Convert True Course to Magnetic Course Look for an isogonic line on the sectional chart closest to the drawn course. For long flights, its possible that you’ll fly over multiple isogonic lines, and will need to use different magnetic variations. Recall that westerly variations are added to the true course to convert to magnetic course, and easterly variations are subtracted from the true course to convert to magnetic course. Easterly variations are found west of the agonic line, because magnetic north lies east of true north from any position west of the agonic line. Westerly variations are found east of the agonic line, because magnetic north liest west of true north from any position east of the agonic line. The memory aid ‘West is best, East is least’ can be used to recall this. In this example, the closest isogonic line to our course if the 14° 30′ line, so we’ll round that up to 15° E variation and subtract 15° from each true course to obtain a magnetic course. Calculate Wind Correction Angle (WCA) and Groundspeed (GS) Use the wind side of your flight computer to determine the WCA and GS for each leg. See Using the E6-B Flight Computer for assistance in calculating the WCA and GS. Since our legs use four different magnetic courses, we’ll need to calculate a WCA and groundspeed for each different course. Recall that the winds aloft at our cruise altitude are 200@5, and that winds aloft directions are measured from true north so we’ll need to use your true course when building the wind triangle on the wind side of the flight computer. So, for the first leg, we’ll plot that our winds are from 200°, measure up 5 knots from the grommet, then turn the wheel to 242°, slide the wheel until the wind mark is on 114 (our planned TAS), and read the WCA from the plotted wind mark, and the groundspeed underneath the grommet. In this case, the result is a WCA of -1 and a groundspeed of 110. I’ll fill this in on the navigation log and calculate the remaining legs. I’ll also apply the WCA to a the magnetic course (MC) to calculate the Magnetic Heading (MH). Correct for Magnetic Deviation Magnetic fields in the airplane affect the compass’s accuracy, and the magnitude of the error may vary depending on the orientation of the airplane. Each compass installation must be calibrated and deviation card is produced to inform the pilot of the expected error. The deviation card is typically located in a holder next to the compass. During your preflight planning, you’ll need to make a copy of this course. I’ve obtained the compass deviation card for the N212CF. As the leg headings are between 210° and 240°, which both have a deviation correction of +3°, we’ll add 3° to each magnetic heading (MH) to obtain a compass heading (CH). Calculate Estimated Time Enroute (ETE) Using the computer side of the E6-B, we’ll solve a Rate-Time-Distance problem to determine the amount of time it will take to fly each leg at the calculate groundspeed. For the first leg, we’ll be 16 NM at 110 kts groundspeed. Now, the first leg also includes our climb to our cruising altitude, so while we’re climbing we won’t yet be at 110 knots. 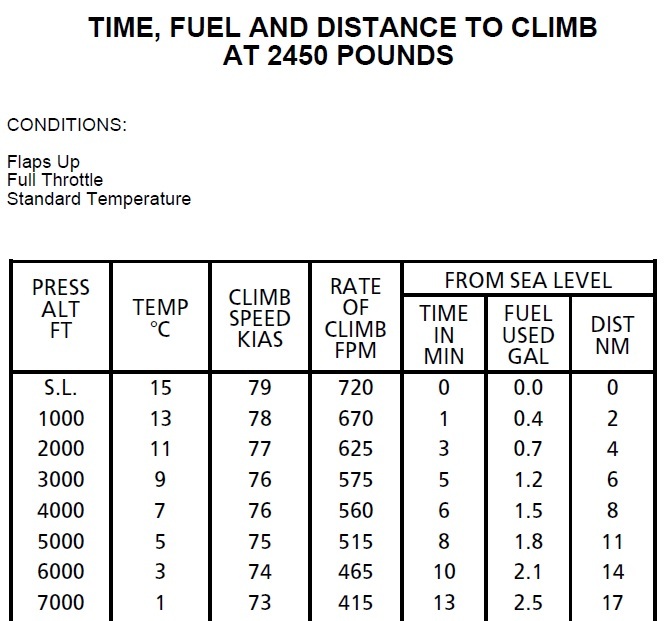 Instead, we’ll look up the amount of time it will take to climb using the Time, Fuel and Distance to Climb table in the flight manual. To this this table, we’ll need to read across the table to find time, fuel and distance to climb to our cruise altitude, and subtract the time fuel and distance between sea-level and our departure airport. In this case, we’ll interpolate between 4000 and 5000 (for 4500 ft) to get 7 mins, 1.65 gals and 9.5 NM. We’ll then subtract 1 min, 0.4 gal and 2 NM because Cameron Park’s field elevation is 1287 and typically we have high pressure, bringing the pressure altitude closer to 1000. This gives us 6 mins, 1.25 gals and 7.5 NM to climb from Cameron Park to 4500 ft. I’ll then edit the first leg to reflect that it will take 7.5 NM, climbing at 79 knots (Vy in the CE-172-R) and it will take 6 minutes to reach TOC. This leaves 8.5 NM left at 110 knots to reach our first checkpoint, Mather Airport, which using the E6-B to calculate results in 4.5 minutes. We can then calculate the remaining legs using the E6-B. Calculate Top of Descent (TOD) There are two approaches to planning when to initiate a descent. 90 KT GS: Altitude to lose in thousands of ft x 3 miles per 1000 ft = miles out to start descent. In this example, we’ll need to descent from 4500 to to 117 ft, which is basically sea-level, so we’ll round that up to 4500 ft of altitude to lose. We’ll use the Constant 500 FPM method and as our planned groundspeed is approximately 110 knots, we’ll round that up to use the 120 KT GS calculation. 4.5 x 4 miles = 18 miles out to start our descent. As our Dixon checkpoint is 7 NM from our destination, that leaves 11 miles between our TOD checkpoint and Dixon. We’ll update our navlog to show reflect this, and recalculate ETEs for the KSAC to TOD and TOD to Dixon legs. We now have a plan to initiate our descent for Nuttree airport 3 minutes after crossing our Sacramento Executive airport checkpoint. Calculate Fuel Burn Using the computer side of the E6-B, we’ll determine the fuel requirements for each leg. Refer to the Using the E6-B Flight Computer guide for assistance in solving fuel burn calculations. For the first leg to Top of Climb, we’ll use the fuel burned we previously calculated, and add to that the amount of fuel burned during engine start, taxi and takeoff, which can be found in the notes section of the Time, Fuel and Distance to Climb table. The fuel requirement is 1.1 gal For the CE-172-R, which we’ll add to the 1.25 gals we previously calculated to climb to 4500, which results in 2.35 gallons burned for our first leg. We’ll use the flight computer to calculate the remaining fuel requirements for each leg using our planed 8.5 GPH fuel burn rate. I’ll round up all calculate to the nearest tenth of a gallons to simply the math and add margin. Total Distance, Time and Fuel Columns To understand the total distance, time and fuel, sum up each column and enter it at the bottom of the navigation log table. Our trip from Cameron Park to Nuttree Airport in Vacaville will cover 50 NM, take 29 minutes and burn 5.9 gallons of avgas.